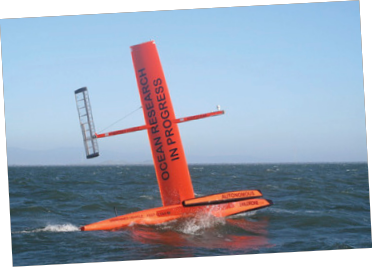 Designed by Richard Jenkins, who holds the world land speed record for a wind-powered vehicle, Saildrone is a wind-powered autonomous surface vehicle for ocean science. The design, materials, and control of the Saildrone are all 21st century. The Marine Conservation Institute is hoping that the equipment will eventually be used to fight a very 21st century problem, illegal fishing within US marine monuments and other marine protected areas. Strong protection will be a major component of the criteria in our Global Ocean Refuge System (GLORES) initiative, a strategic, science-based way to safeguard marine ecosystems on a global scale. GLORES is designed to catalyze strong protection for at least 20% of the world’s oceans; and those healthy areas will be natural targets for illegal fishing. Saildrone measures 19 feet long, the mast rises 20 feet above the surface of the water, and the boat uses basic sailing fundamentals and wind power to navigate itself. With a solid, freely rotating sail controlled by a tail, Saildrone maneuvers rather easily and smoothly across the water. High-strength carbon fiber and solar panels protect and power the on-board electronics such as cameras, hydrophones, radar, satellite phone communications and vessel identification radio systems. This unmanned watercraft could eventually change how we: monitor and do research in the open seas; catch illegal fishermen who destroy marine environments and reefs; and, for recreational sailors, ensure there will be incredible sites to sail to and explore in the future. With the condition of the world’s oceans rapidly degrading, understanding human impacts on the ocean and protecting as much of it as possible have become priorities for Marine Conservation Institute. One of the most pervasive problems our oceans face is over-extraction of marine resources, especially fisheries. The negative impacts of IUU (illegal, unreported and unregulated) fishing include economic losses to fishermen, destruction of marine ecosystems like coral reefs, and participation in drug smuggling and human trafficking. IUU fishing is well known by government and ocean groups and is particularly harmful and rampant within open seas beyond national jurisdiction remote marine protected areas and U.S. marine monuments in the Pacific, but little progress has been made in curtailing this criminal activity because marine law enforcement is difficult and expensive. Monitoring and enforcement with current technologies such as Coast Guard cutters, airplanes and satellites costs tens of thousands of dollars per hour or day to operate. Finding some way to lower the cost of doing surveillance and enforcement is essential to prevent our marine protected areas from turning into marine poaching areas. Enter the Saildrone autonomous sailboat as a potential cost-effective monitoring and enforcement tool. To begin testing this concept, Marine Conservation Institute asked the people who run Saildrone to do an experimental run in late 2013 around Palmyra Atoll. The atoll is one of the Pacific Marine National Monuments and a perfect place to begin experimenting with this potential enforcement tool. It is a thousand miles or more south of Hawaii, and commercial fishing is banned around it for 50 nautical miles in every direction. For the trial run, Saildrone diverted one of its unmanned boats to circumnavigate Palmyra Atoll. The weather wasn’t exactly a sailor’s dream: winds in the area are normally very light and currents are strong (around 2.5 knots) due to the atoll’s position within the equatorial current. Despite these adverse conditions, 48 hours after arriving, Saildrone had completed a 100-mile circumnavigation of the atoll, careful to stay outside the 12-nautical mile radius around the atoll that only specially permitted boats may enter. The success of Saildrone’s trek proved its potential as a tool for IUU monitoring and enforcement within remote marine protected areas. The boat returned unscathed to San Francisco after more than 100 days and 6,000 miles of travel. Next up is to add cameras and sensors and really show that these autonomous sailboats can detect and identify IUU fishing boats! While most sailors will not get to play with this new sailing technology any time soon, its potential to protect the magnificent sites seafarers dream of visiting comes as a wonderful consolation prize. This Sailors for the Sea Ocean Watch Essay is reprinted with permission. Special thanks to Hilary Kotoun, Sailors for the Sea’s Communications and Programs Manager. For more information, visit www.sailorsforthesea.org.